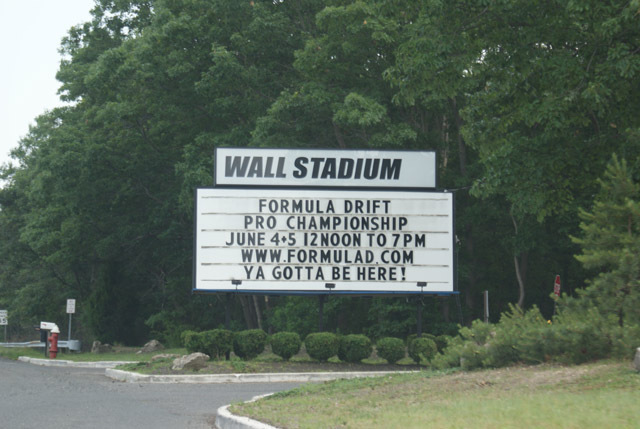 Wall Stadium hosted Round 3: The Gauntlet to a packed venue. Fans were treated to clear weather and an action-packed weekend. The level of competition has increased forcing multiple “One More Time” calls from the judges, which gave the fans more head to head action. Round 3: The Gauntlet showcased exciting tandem action that had Daijiro Yoshihara in the Discount Tire / Falken Tire Nissan S13 take his second consecutive victory by beating out Falken teammate Vaughn Gittin, Jr. in the Monster Energy / Falken Tires Ford Mustang in the Finals for the second time in a row. Gittin has now found the podium in each of the 3 events this season with a victory at Round 1 and two second place finishes at Round 2 and Round 3 and retains the Pro Championship points lead. The consolation round placed last season’s winner Darren McNamara in the Falken Tires Saturn Sky against 2-time Formula DRIFT champion Tanner Foust in the Rockstar Energy Drink Scion tC with Foust edging it out for third place at the event.